In the ancient North Yorkshire village of Giggleswick, situated just a mile to the north-west of Settle, can be found the beautiful church of St. Alkelda. An architectural and historical treasure trove, the churches recorded origins date back to the 13th Century. Much of the present building is 15th Century; this having been significantly renovated towards the end of the 1800’s under the instruction of Lancaster architects Paley, Austin and Paley. St. Alkelda’s is one of only two churches in the country dedicated to the little-known Saint of the same name, the second being the church of St. Mary & St. Alkelda, Middleham, also in North Yorkshire. Originally rumoured to have been an Anglo-Saxon Princess with possible connections to a monastery at Middleham, legend has it Alkelda was strangled to death for her faith by raiding Viking women while travelling between Middleham and Giggleswick in around 800AD. However, this legend and Alkelda’s very existence have both been questioned following modern research. There is certainly no formal recognition of her martyrdom. Given the obvious lack of/difficulty in sourcing contemporary records from the period, research into this particularly local saint have unsurprisingly been inconclusive. It would seem that, based on the information available, she was a real historical person who lived in or around Middleham and who was associated in some way with the Holy Wells found at both Middleham and Giggleswick and that by this association she was considered to be “saintly”. A further connection to the wells stems from her name itself; Alkelda being a composite name of the old English-Norse word haelikeld meaning holy well. One thing is known for certain; during renovations of St. Mary & St. Alkelda’s in Middleham in 1878, under which a centuries old tradition told that the remains of Alkelda where laid to rest, an ancient unmarked stone coffin containing the bones of a women were dug up. Who was this if not the mysterious Alkelda? 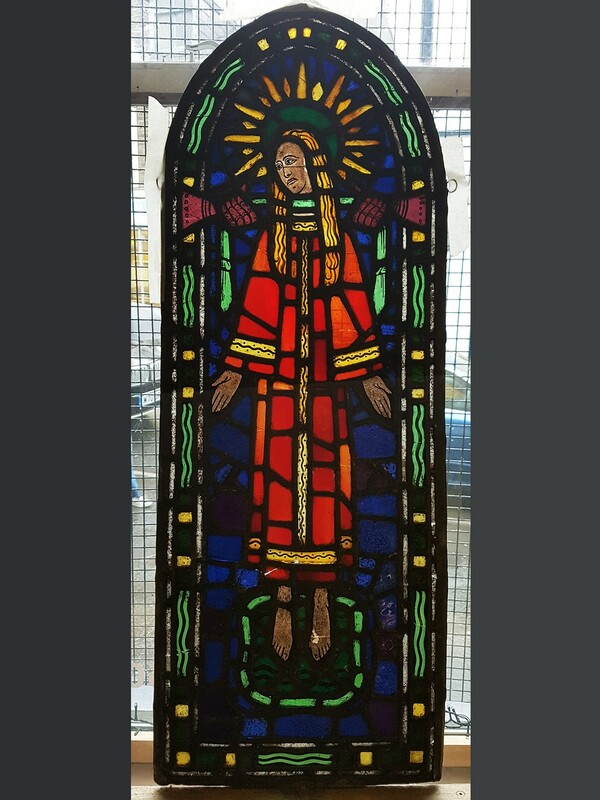 And so to the mystery of the St. Alkelda stained glass panel……….. 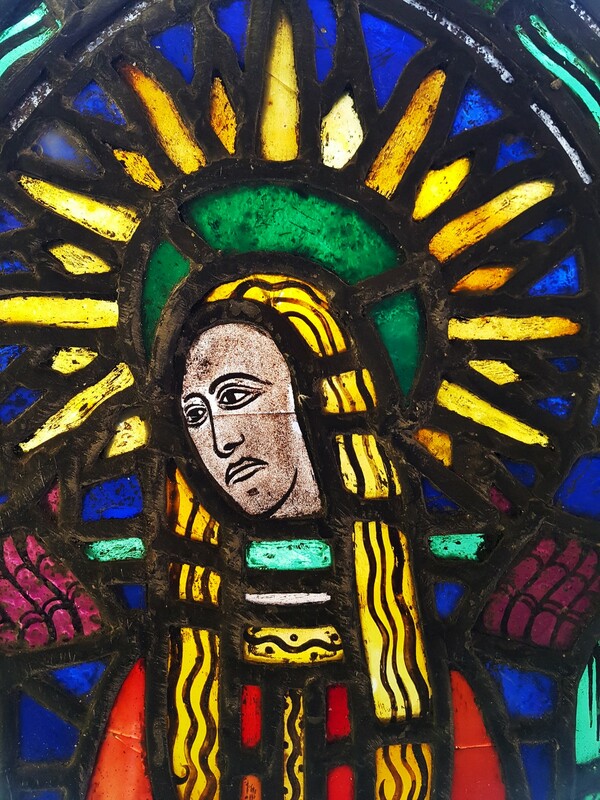 In 2014, whilst searching Giggleswick’s Parish Rooms for items to sell, two ladies discovered a panel of stained glass that had been unceremoniously dumped under a pile of papers and rubbish. On cursory inspection, the dusty, damaged panel was thought to represent an angel. It was only after having been dusted down and shown to Revd Hilary Young, the priest in charge, that the depiction of the martyrdom of St. Alkelda (her feet appearing to rest in a holy well), was quickly recognised. Despite its condition, the panel was rightly appreciated for both its simple, stylised beauty and historical merit and duly set aside in a safer location. Who was the original artist and for whom/why was the piece made? How did it come to be left in the Parish Rooms and by whom? What would happen to the panel in the future? Perhaps most intriguingly of all was a question thrown up in connection to the possible age of the piece, a question that would dictate the next step in the story of the panel. 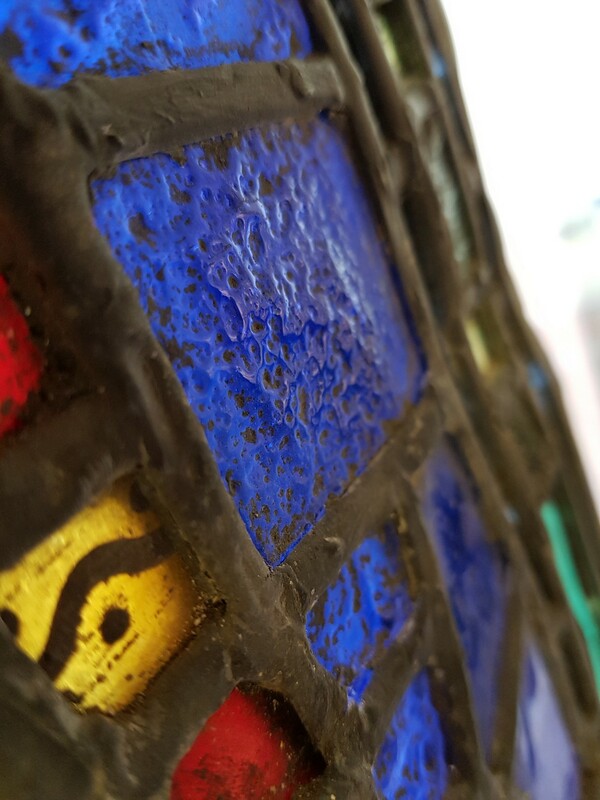 Could it contain fragments of medieval glass…….?? In part two of this article we’ll answer some of these questions raised, follow history back to the possible involvement of Oliver Cromwell’s right hand man, take a trip with the panel up to York, and follow Lightworks further involvement in its future. 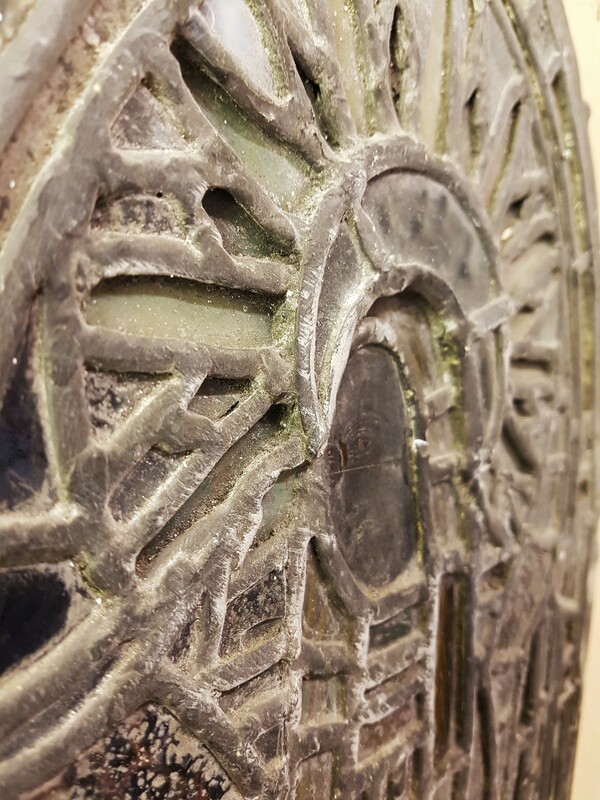 Our images show the panel in its original poor condition prior to intervention and a number of detailed images including Alkelda’s face, the heavily pitted blue glass and the lead-work matrix.